How we make ice cream. All the best homemade goodies come from a recipe and Perry’s Ice Cream is no different. Just like making cookies at home, at Perry’s we use an age-old process to ensure that every batch of our ice cream is as good as the last. First, we add scoopfuls of dry ingredients (such as cocoa) to a portion of liquid ingredients (like milk and cream) and blend them together until they become a consistent mix. Later, the rest of the ingredients are added and stirred. Next, the mix is heated and put into a large pot, where it continues to be stirred and kept warm—just like simmering soup on your own stove at home. Once it has been slow-cooked, it is then cooled and ready to be frozen into ice cream! 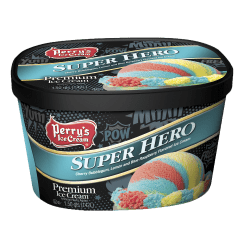 Most people don’t know that Perry’s is one of the few ice cream companies that still slow cooks cream. New technology exists that would enable us to finish this process in about 17 seconds—but we prefer to do it the old-fashioned way. Ice cream is all about the flavor and the quicker process just doesn’t produce the same taste. We know, because we’ve tried it. It’s the difference between fast food and a home cooked meal. There is just no comparison. Packaged Products—These include all products in a container like the pints, quarts and family size cartons you buy at the store, and the tubs they scoop from at ice cream stands. All our ice cream mix is put into a freezer where air is infused into the product while it is freezing. Without the addition of air, your favorite flavor would be as hard as a rock! As the ice cream freezes, crunchy nuts, scoops of chocolate chips, yummy fudge sauce and all your other favorite toppings are added. Stick Novelties—The mix for Perry’s famous stick novelties (like Orange Buddie Bars and Fudgie Bars) is poured into ice cream molds (much like ice cube trays) that move along a conveyor. As the molds travel, they are frozen and sticks are inserted. Once the bars reach the end, they are removed from the molds. The machine dips some bars into gooey chocolate or crunchy coating and then places them into the wrapper. Other Novelties—At Perry’s, we have a special machine that quite literally sandwiches our ice cream with cookie wafers to make novelties like vanilla ice cream sandwiches. It’s incredible to watch because we can actually make about 200 ice cream sandwiches in just one minute! Our ice cream cones like Vanilla Nutty Cones are pre-wrapped and placed on a chute where the inside is coated with chocolate. Next, they are filled with ice cream, sprinkled with nuts and topped with even more delicious chocolate. Finally, a lid is placed on top of the cone before it’s packed into a box. At Perry’s all of our finished products are stored in our frozen storage area at temperatures between -15º to -18ºF. From the frozen storage area, ice cream is loaded onto our trucks and sent to schools, stores and ice cream stands.